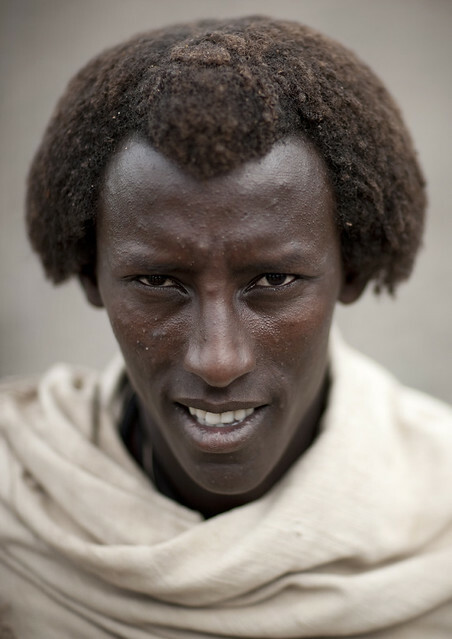 The Karrayyu are ancient pastoralist Cushitic speaking Oromo ethnic group residing in the Awash Valley, around the volcano of Mount Fentale and the Metehara Plain (Great East African Rift Valley) in the Fantalle District of Oromia. 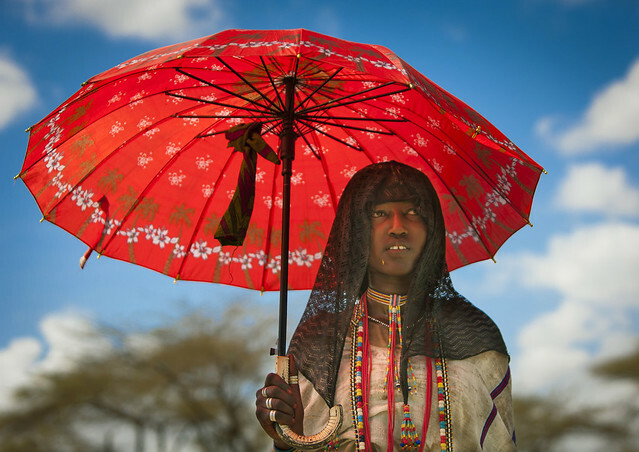 Karrayyu woman with umbrella in Gada ceremony – Ethiopia by Eric LafforgueAs one of the few Oromo groups to have preserved their indigenous tradition and pastoralist way of life, the Karrayyu are seen as the guardians of Oromo cultural heritage of the Horn of Africa. 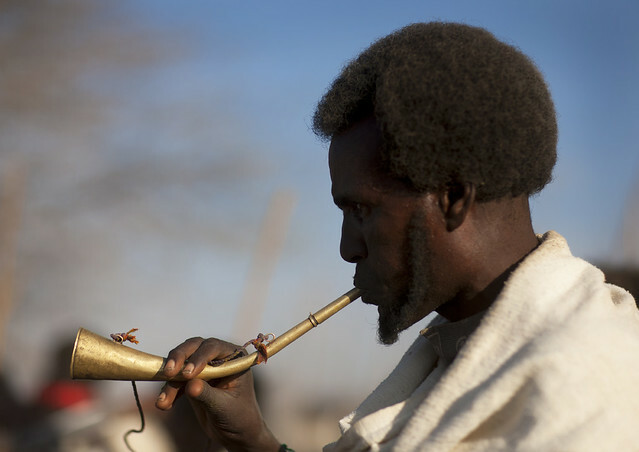 The Karrayyu are facing extinction as their number keep dwindling as they remain as one of the last remaining Oromo groups to maintain the pastoralist way of life as well as the traditional Oromo culture, along with the Borana, Guji and Kamise Oromo. 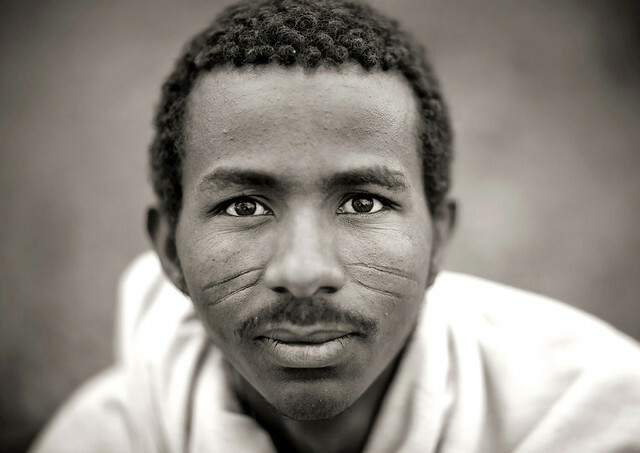 The Karrayyu, apart from being considered by many Oromo as guardians of their ancient culture can be differentiated from other Oromo ethnic groups by the two horizontal tribal marks on the cheeks of their women and the Gunfura traditional hairstyle of their men. 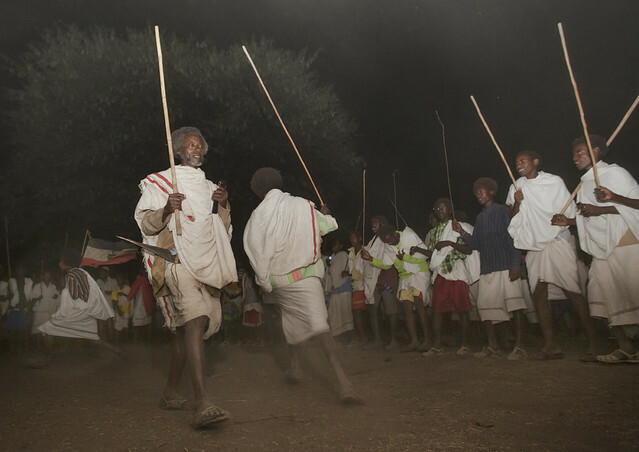 Karrayyu are known to the world for their famous Gada ceremony. 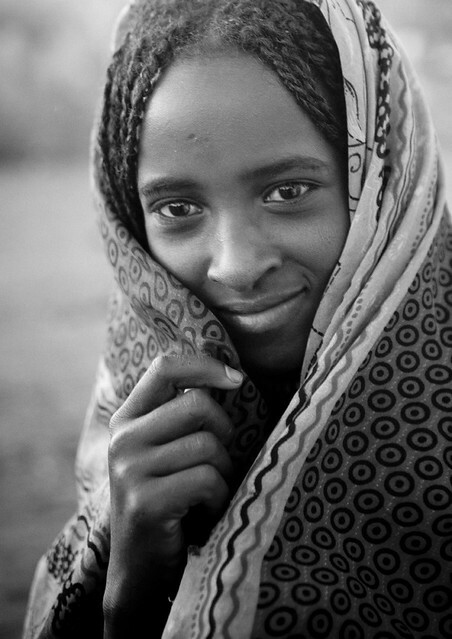 Interestingly, the main parent Oromo people are the largest Kushitic group and the second largest nation in Africa. 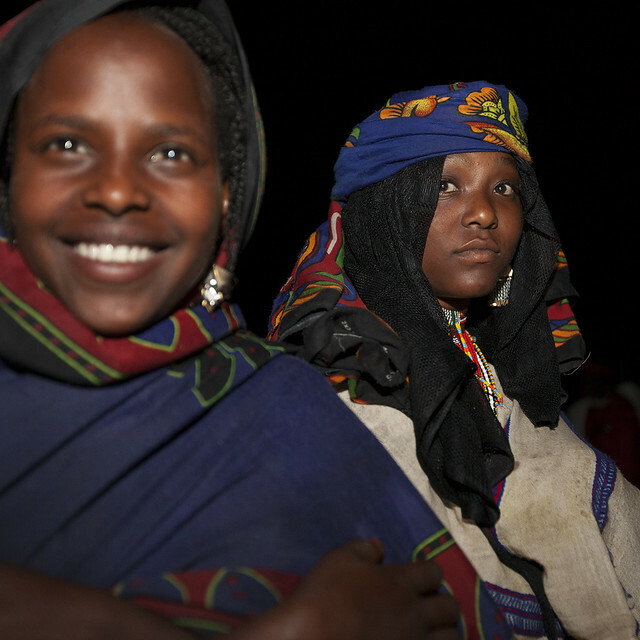 Their population is about 33 million representing the majority (32%) of the Ethiopian population.. 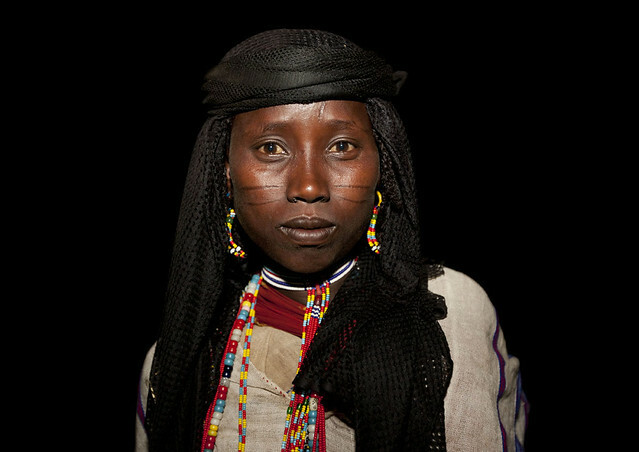 They have a distinct cultural and linguistic identity of their own. 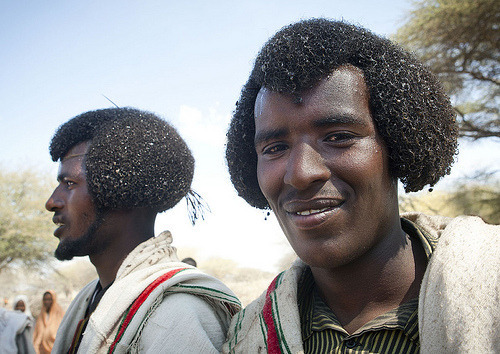 They have inhabited a separate and well-defined territory in the Horn of Africa for centuries. 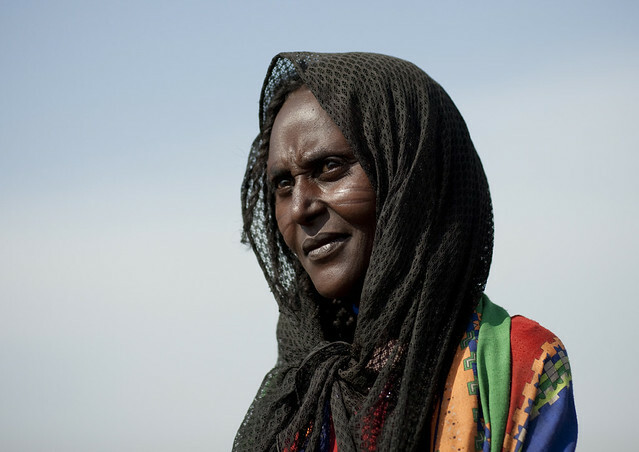 Karrayyu people speak an Afaan Oromoo, a language of Oromoo with distinct linguistic characteristics of East Cushitic language. 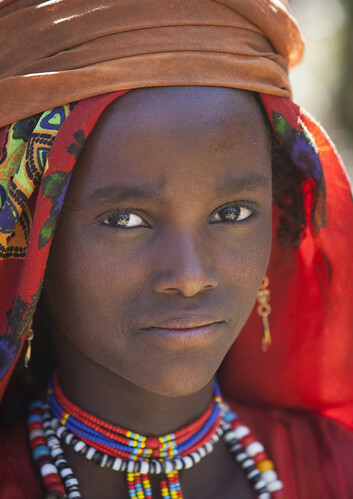 It is said the Karrayyu arrived in the area 200 hundreds years ago, during the so called “great expansion”, of the Oromo, during which Oromo settled in different parts of Ethiopia. 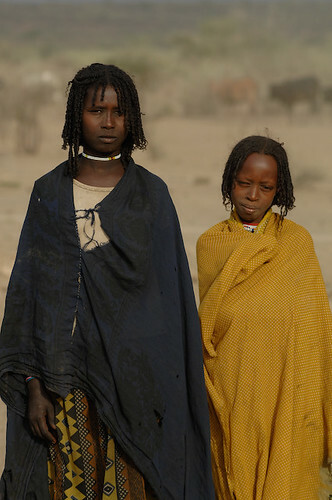 There are only 10 000 to 55 000 Karrayyus (because of their nomadic lifestyle it is difficult to have precise figures) whereas they used to be 200 000 at the beginning of the 20th century. Karrayyu are on the verge of instinction. Such a drop was due to the persecutions the Oromos, including the Karrayyu people had to face during Menelik’s II reign (1889-1913). This emperor, from the Amhara ethnic group led the unification of Ethiopia, and imposed the Amhara rule to the Oromos. 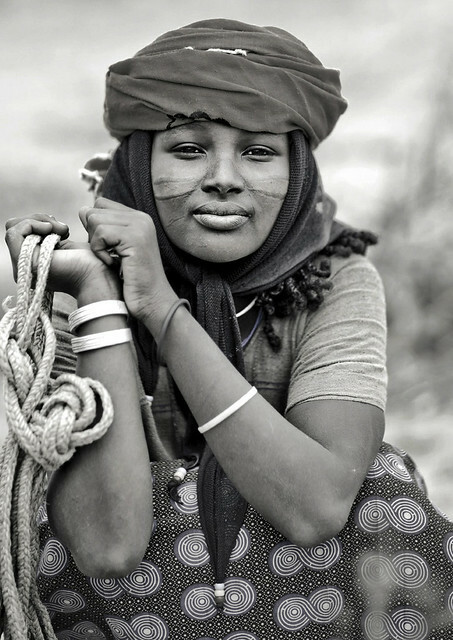 Later, during the 20th century, the Karrayyu were deprived of most of their lands because of the establishment of national parks and modern farms. In the last four decades, Karrayyu’s were dispossed from 70 per cent of their land, including their shrines, by the government to make sugar and cotton plantations. 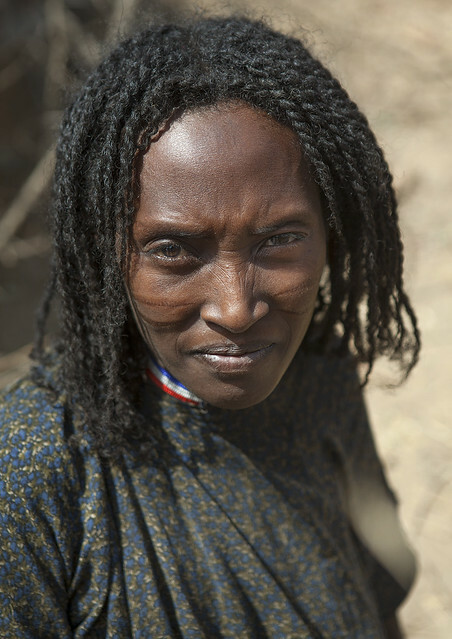 Karrayyu are a nomadic-pastoralist who only attends to Livestock rearing. They hardly farm as they engage in buying of food from their neigbhours. 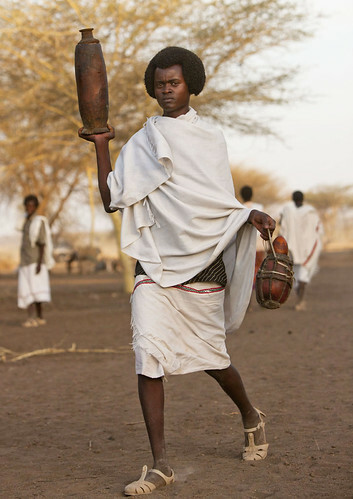 The Karrayyu also practice the Gada system, an ancient and complex form of African democracy which is traditionally based on generation sets which alternate power every eight years. One full Gada cycle lasts 40 years. 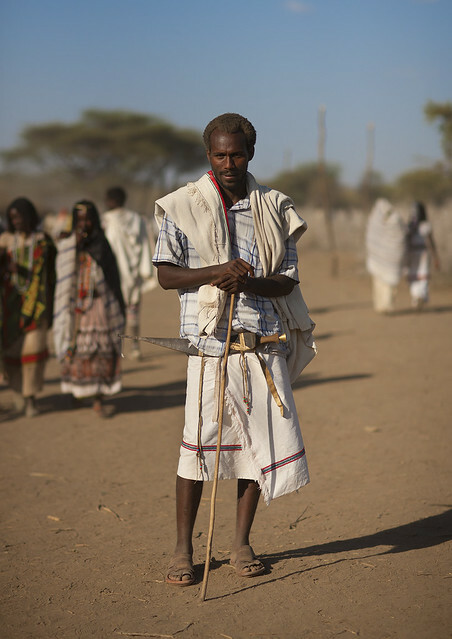 Gada is a uniquely democratic political as well as social institution which governs the life of individuals in Oromo society from birth to death. 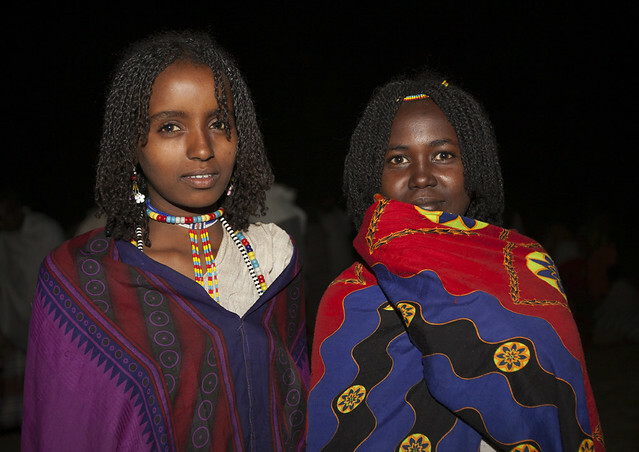 One highly developed self-sufficient system which has influenced every aspect of Oromo life is the Gadaa system. 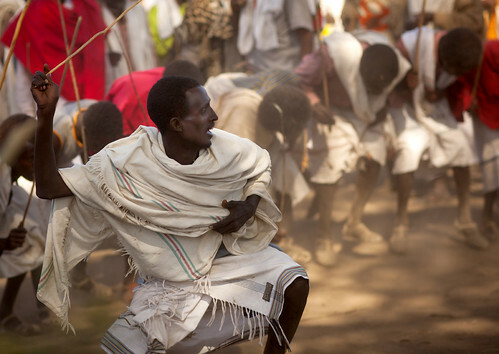 It is a system that organizes the Oromo society into groups or sets (about 7-11) that assume different responsibilities in the society every eight years. 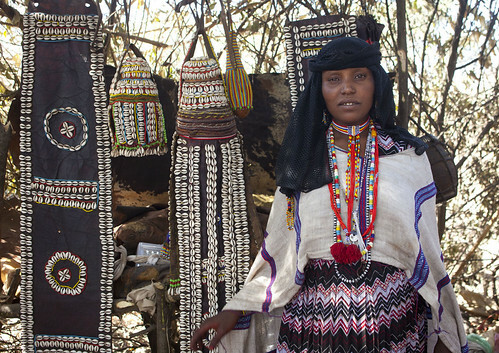 It has guided the religious, social, political and economic life of Oromo for many years, and also their philosophy, art, history and method of time-keeping. 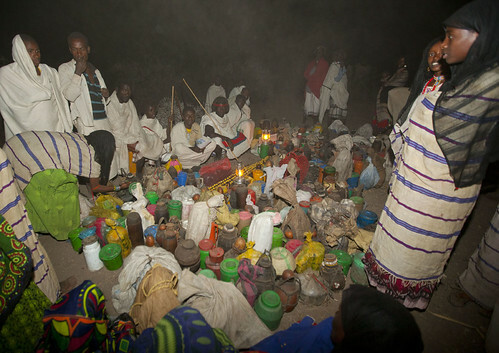 The activities and life of each and every member of the society are guided by Gadaa. 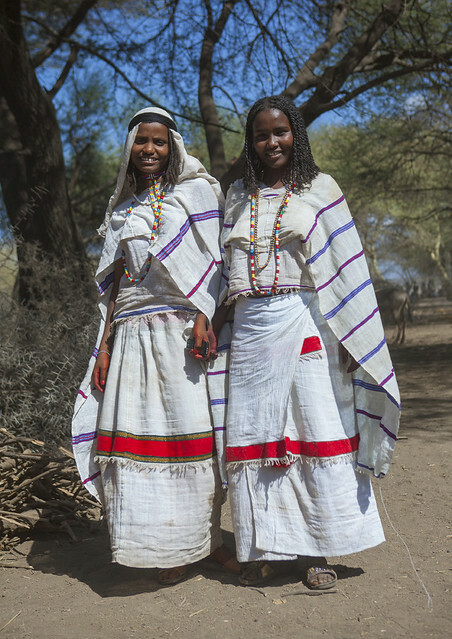 It is the law of the society, a system by which Oromo administer, defend their territory and rights, maintain and guard their economy and through which all their aspirations are fulfilled. 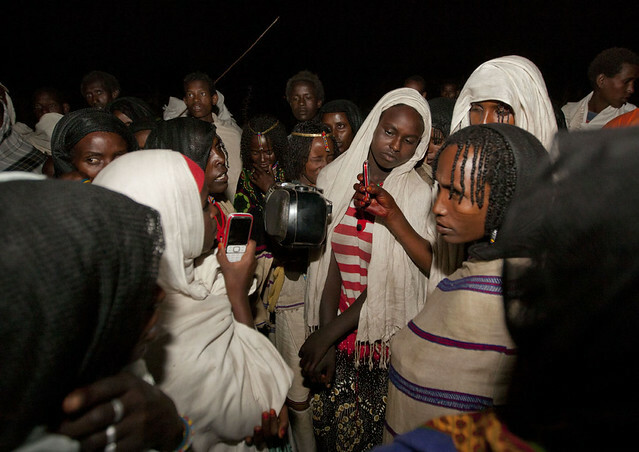 The Gadaa system has served as the basis of democratic and egalitarian political system. Under it the power to administer the affairs of the nation and the power to make laws belong to the people. Every male member of the society who is of age and of Gadaa grade has full rights to elect and to be elected. All the people have the right to air their views in any public gathering without fear. We will briefly describe the duties of a Gadaa class as it passes through the above grades. 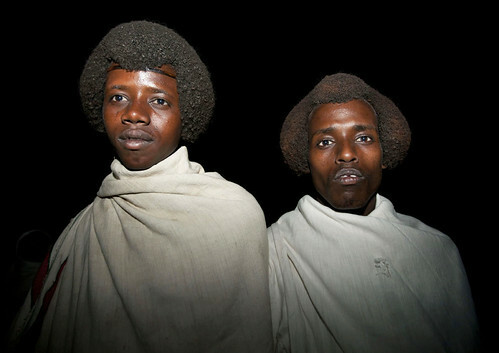 The Dabballee are sons of the Gadaa class who are in power, the Luba. They are boys up to 8 years of age. Thus this is a stage of childhood. Upon reaching their eighth year, they enter the Folle grade. At this age they are allowed to go further away from their villages and to perform light work. Horsemen in TouramentAt 16 years old, they enter the Qondaala. They may now go long distances to hunt and perform heavy work. 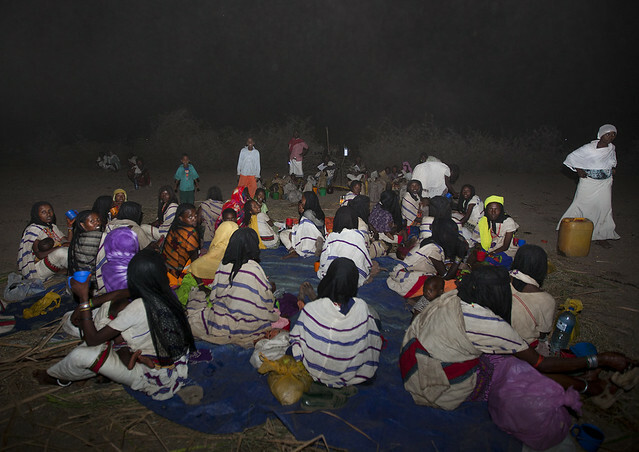 Three years before the Qondaala ends, those of the Gadaa class come together and nominate the future group leaders (hayyu council) who eventually will constitute its presidium and thereby the executive, judicial and ritual authorities. The final election is preceded by an often lengthy campaign of negotiations. After nomination, the candidates tour the region accompanied by their supporters to win the backing of the people before election, The individuals will be elected on the basis of wisdom, bravery, health and physical fitness. In the Kuusa grade, the previously elected leaders are formally installed in office, although they do not yet assume full authority except in their own group. This is one of the most important events in the life of the individual and the Gadaa system over all. In the next grade, Raaba Doorii, members are allowed to marry. This and the Kuusa grade constitute a period of preparation for the assumption of full authority. At the end of this period the class members enter Luba or Gadaa, the most important class of the whole system, attain full status, and take up their position as the ruling Gadaa class. At this stage the system comes to a stop momentarily and all men move to the proceeding class vacating the last class which is the immediately occupied by a new class of youth who thus begin their ascent of the system’s ladder. The former ruling class, the Luba, now becomes Yuba. The Yubas, after passing through three separate eight-year periods, are transferred to the Gadamojjii class. Then they enter the final grade called Jaarsa and retire completely. 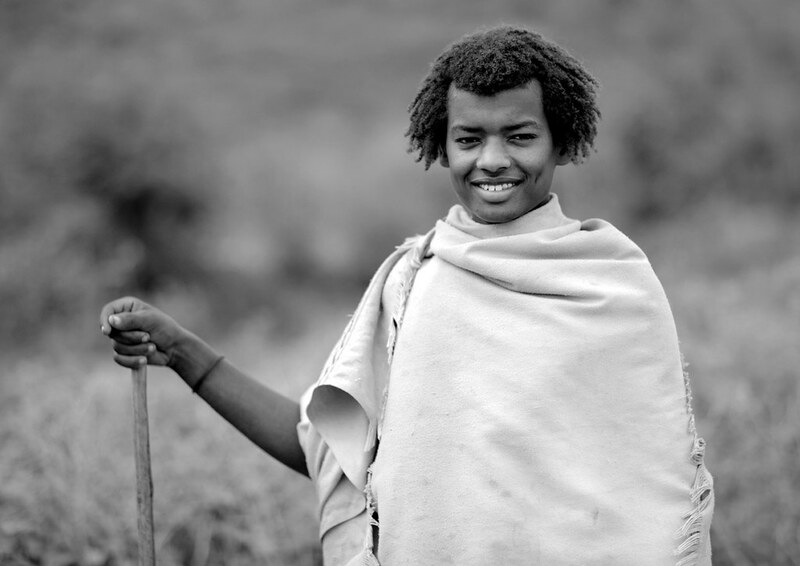 As described briefly above, when the Oromo man passes from one stage to the next, his duties and way of life in society change. 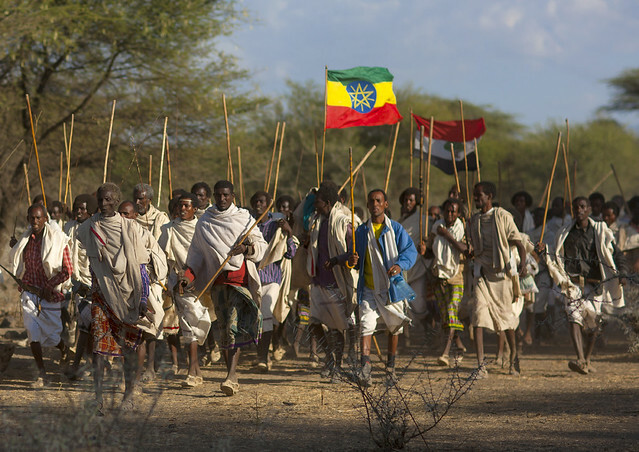 For instance, during the grades of Qondaala, Kuusa and Raaba Doorii, the individuals learn war tactics , Oromo history, politics, ritual, law and administration over a period of 24 years. 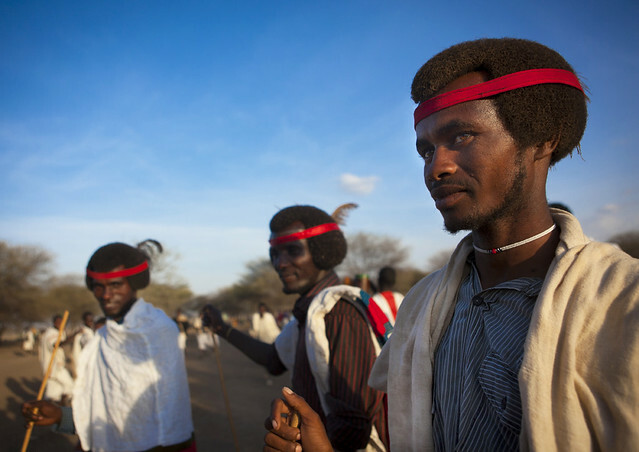 When they enter the Gadaa class or Luba at the age of about 40 years, they have already acquired all the necessary knowledge to handle the responsibility of administering the country and the celebration of rituals. It ends with partial retirement of the whole, group of elders to an advisory and judiciary capacity. 6. Abbaa Seera – Memoriser of the laws and the results of the Assembly’s deliberations. 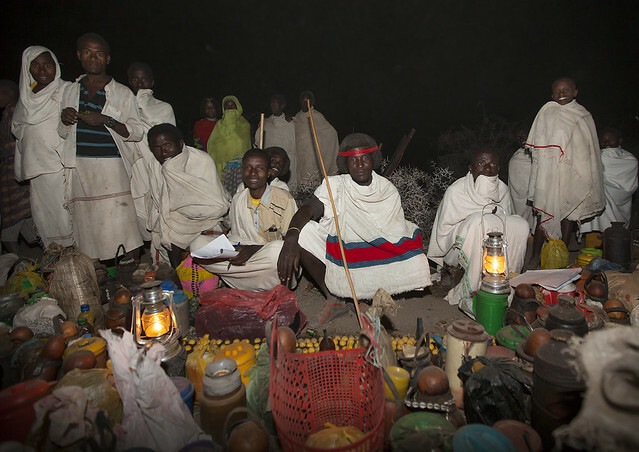 Thus, the entire presidium consists of nine members, called “Salgan Yaa’ii Borana” (nine of the Borana assembly). 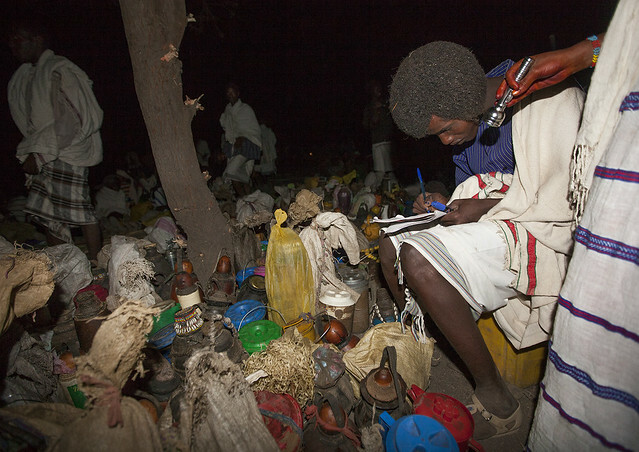 The Abbaa Bokkus are the chief officials. 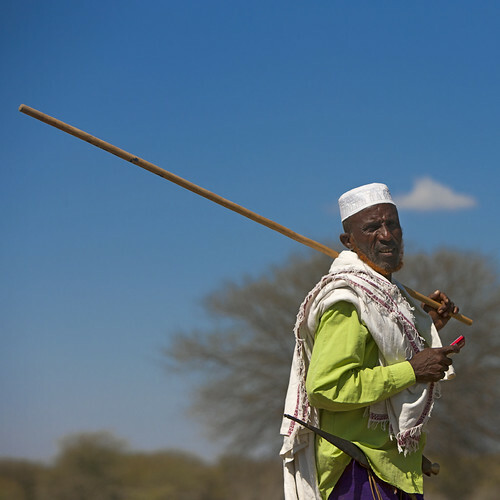 (Bokku is a wooden or metal scepter, a sign of authority kept by the Abbaa Bokku, the president). 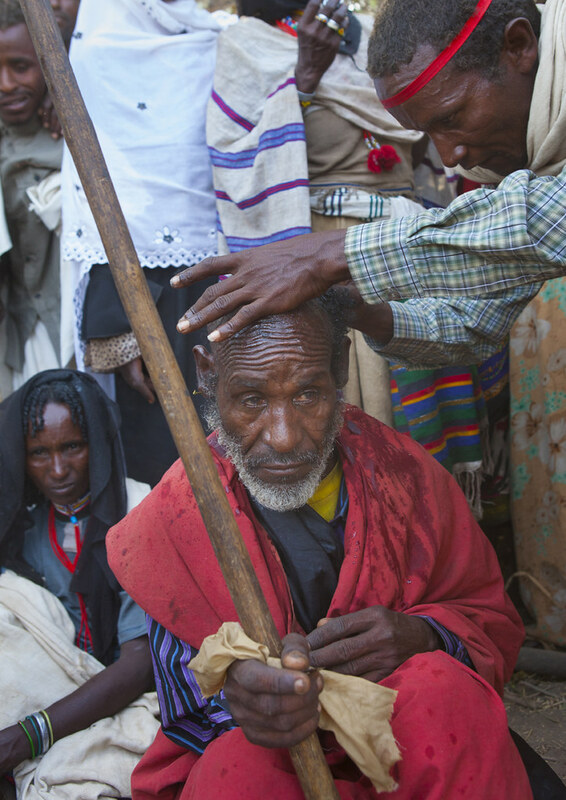 The Abbaa Bokkus have counselors and assistants called Hayyus who are delegated from the lower assemblies. 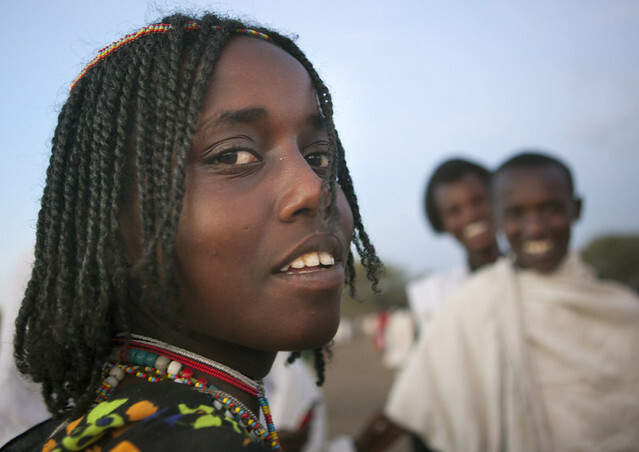 OdaaThere are three level of assembly – inter-clan, clan and local chaffes, chaffe being the Oromo version of parliament. The chaffe assembly was held in the open air in a meadow under the odaa (sycamore) tree. The chaffe made and declared common laws and was source of the accumulated legal knowledge and customs. 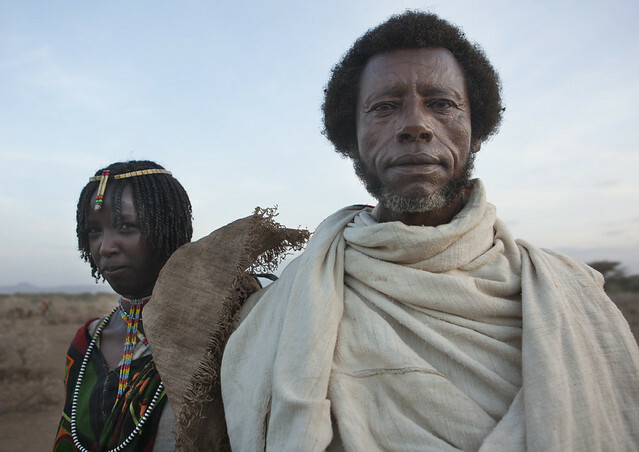 In the hierarchy of Gadaa chaffes, the assembly of the entire presidium of the ruling – Gadaa Class – is the highest body whose decision is final. It is the assembly at which representatives of the entire population come together, at predetermined times, to evaluate among other things, the work of those in power. If those in power have failed to accomplish what is expected of them, the assembly has the power to replace them by another group elected from among the same Gadaa class or Luba. And this was one of the methods of checking and balancing political power in the Oromo society. The second highest Gadaa assembly is the clan chaffe. It is from these assemblies that special delegates to the higher assembly are elected. The lowest Gadaa chaffe is the local chaffe. This is made up of local members of the Luba from among whom representatives to clan chaffes are elected. The holders of these responsible posts can remain in office for eight years only, in normal times, and are then replaced by a new group of officers. The power is handed over at a special ceremony at a special place and time. The office-holders conduct government – political, economic, social, ritual and military – affairs of the entire nation for this period. During war time all capable men fight under the leadership of the group in office. 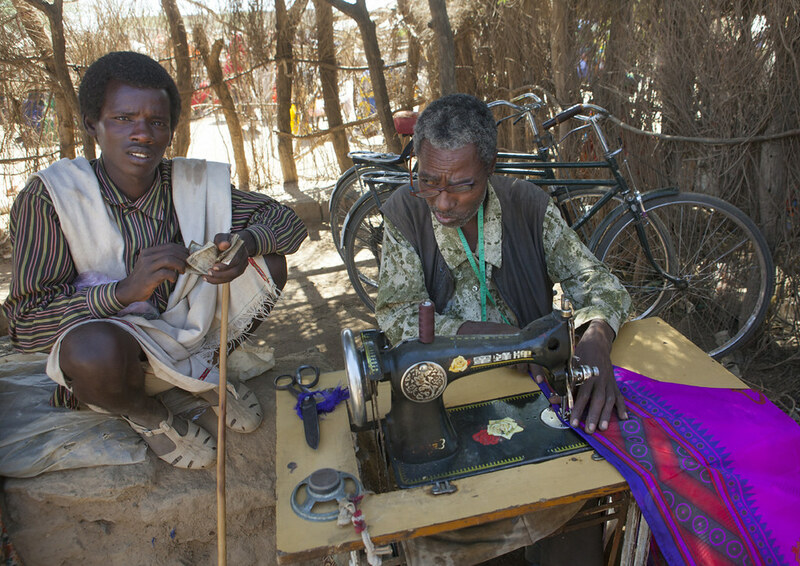 During the eight year period the officials live together in a village (yaa’aa village) and when necessary travel together. There are five Gadaas in a cycle of 40 years. If a man enters office (becomes Luba) now, his sons will become Luba 40 years from now. 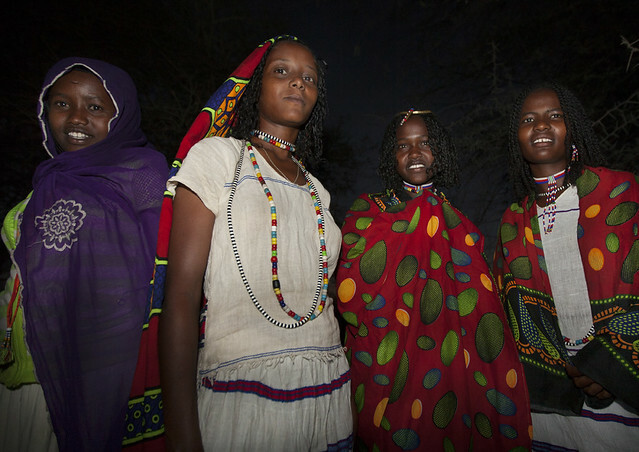 The five Gadaa (sometimes called Buttaa) in the cycle have names, which vary slightly from region to region. 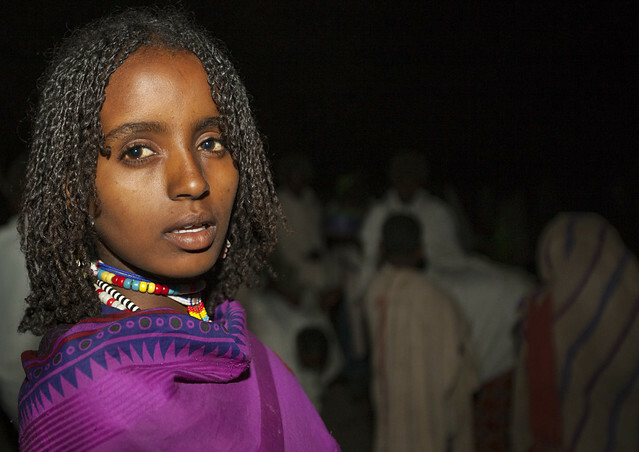 Among some Oromo communities, the sets of five Gadaa names used by the sons are different from those of the fathers. 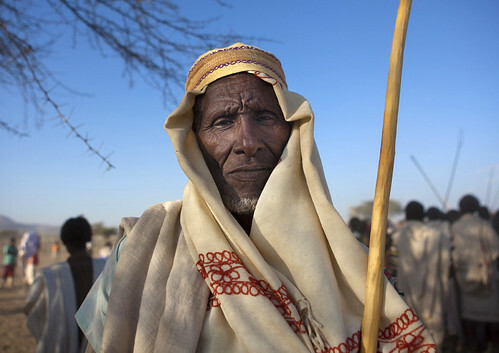 Whereas among other communities, the same set of Gadaa names are used for both fathers and sons. 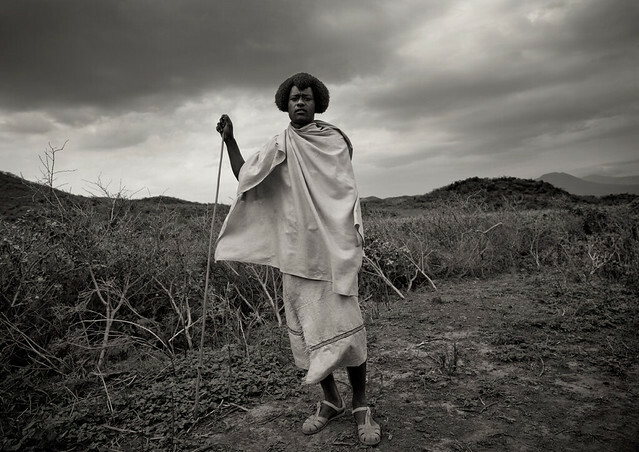 Struggle for grazing lands and water resources is a constant and daily challenge for the Karrayyus. 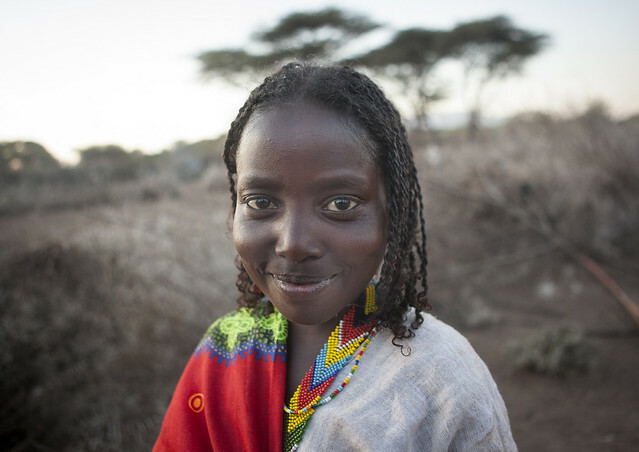 This results in conflicts with neighbouring tribes such as the Afar or the Argoba, but also with some other Oromos ethnic subgroups such as the Arsi Oromo. 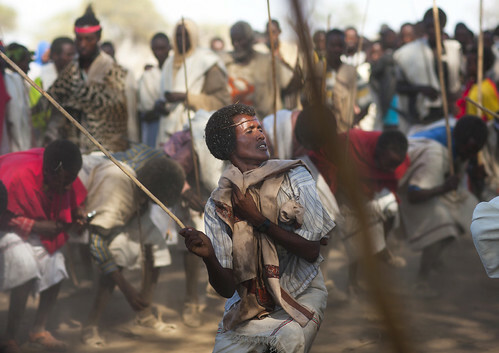 Clashes between herders from these tribes are pretty common, and sometimes people even get shot. 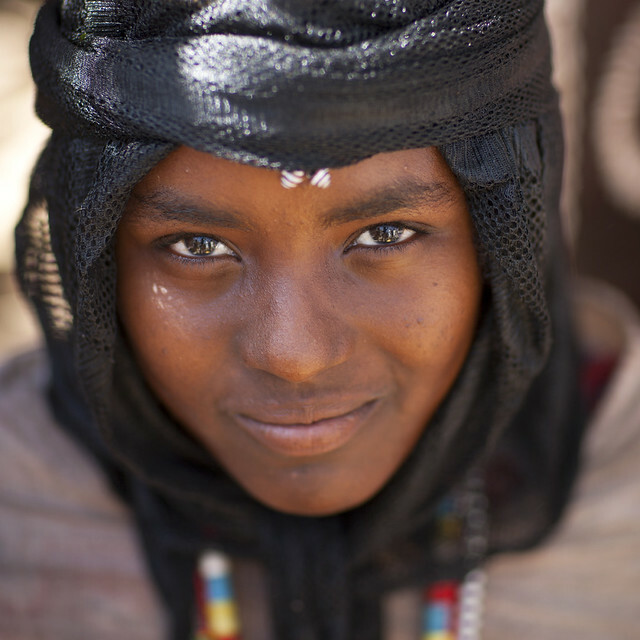 Incidents occur about the possession or when some herders raid the cattle from another tribe. 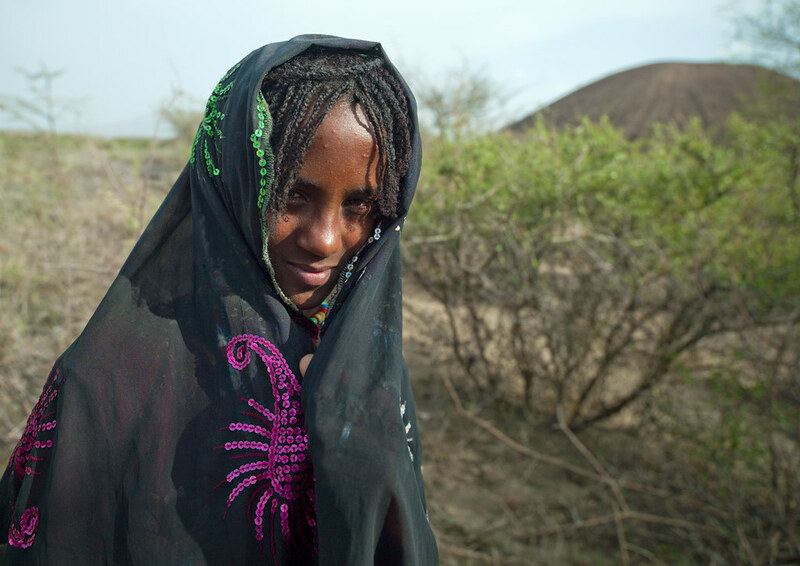 In recent years these conflicts have intensified as the number of available grazing lands has cut down. 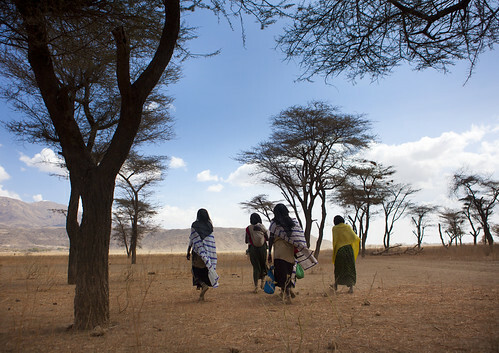 Indeed, overgrazing (involved by the recent of growth of the area’s population) leads to soil erosion. 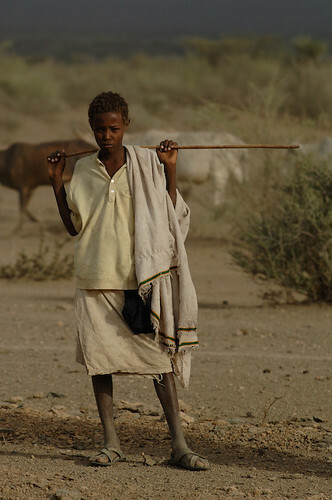 The degradation of the rangelands intensifies the pratice of cattle raiding which is already deeply rooted in the culture of the tribes in this area. 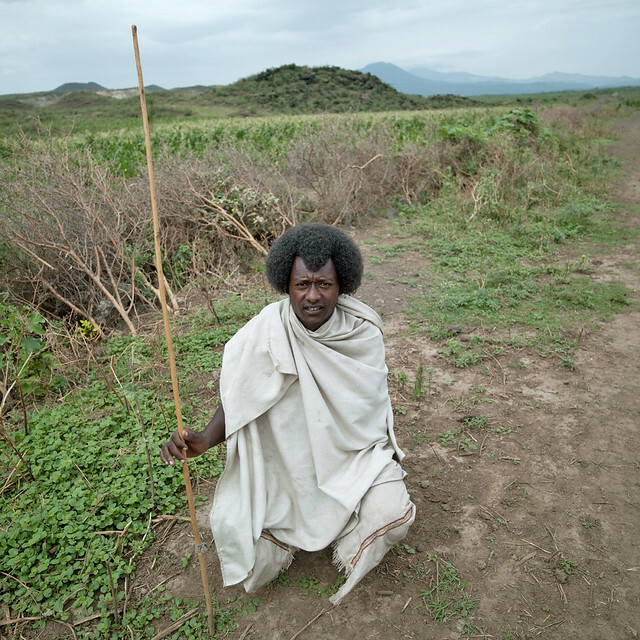 Some grazing lands have even been abandoned by the Karrayyus in fear of violent conflicts. The traditional Karrayyu religion is Waaqeffata, which is a monotheistic religion based on belief in a supreme being called ‘Waaqa’. 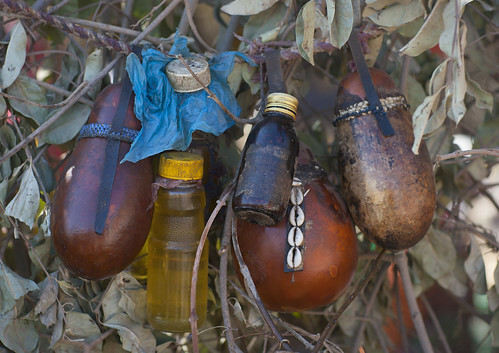 This religion is closely related to the natural world as the Oromo pray to Waaqa at sites believed to be particularly blessed, these sites include certain tree species such as Odaa, at specific lakes and water points and on the top of certain hills and mountains. This does not however make them animists, contrary to some explanations. 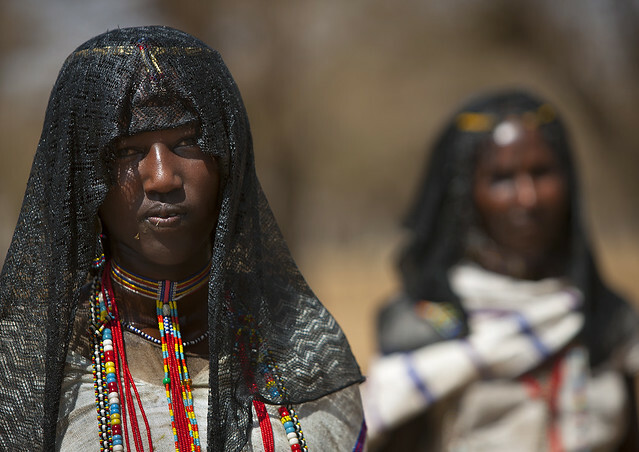 Unfortunately the Karrayyu are also famous for the female genital cutting the women have to face and suffer from. 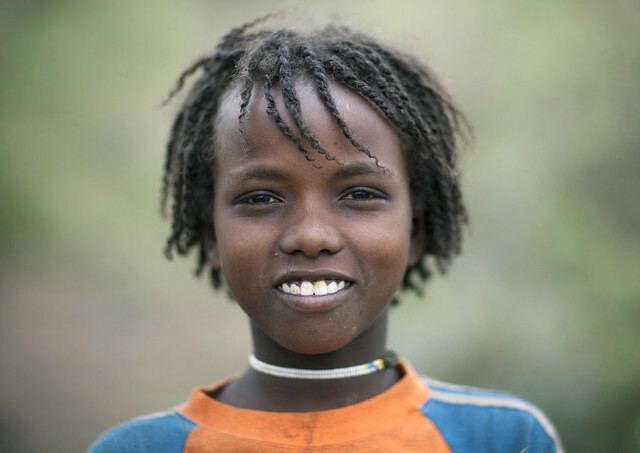 According to the 2005 Ethiopian Demographic Health Survey, more than 74 per cent of women between the age of 15 and 49 have undergone some form of genital mutilation and cutting.. Parents believe this practice guarantees their young daughter’s virginity, which is a prerequisite for an honourable marriage. 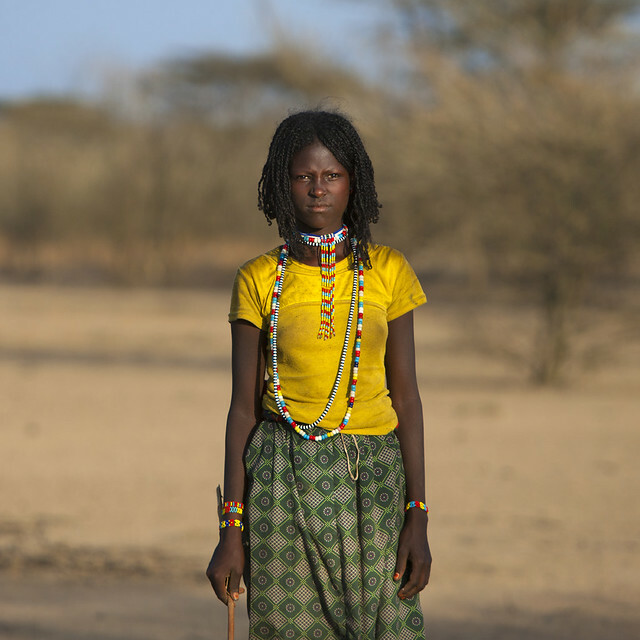 Drought-affected Karrayyu land where climate change, water shortage, conflict, years of neglect by successive Ethiopian governments, and shortage of grazing land makes life the more unbearable. 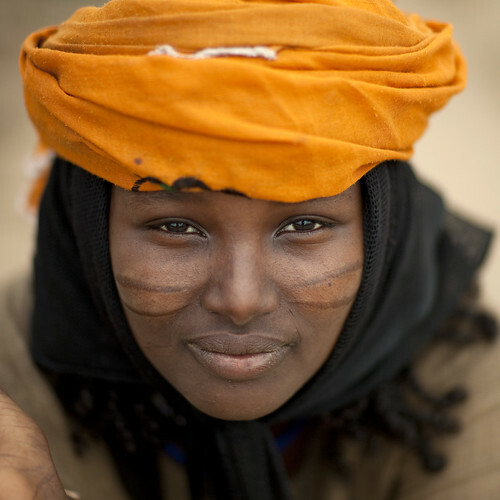 The Karrayyu think all their problems are the work of Waaqa. 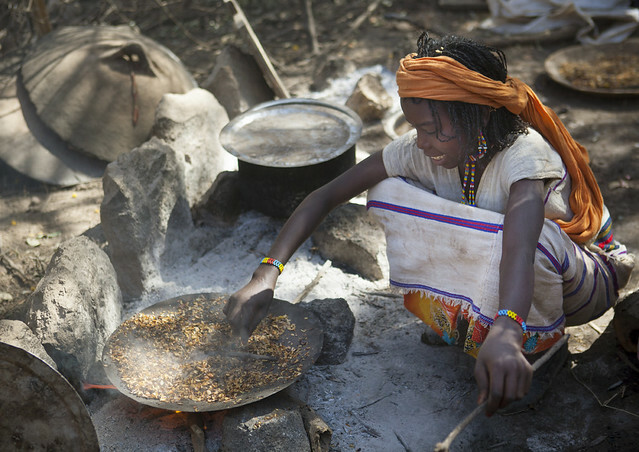 The Karrayyu have already lost a substantial portion of their land to state-led commercial enterprises. The Awash National Park has taken over 60 percent of what used to be Karrayyu land. In the 1950s, the Dutch established the Matahara Sugar factories and its vast sugar estate, displacing the local people and taking their land without any compensation. According to the World Bank, dikes built to protect the sugar plantations restrict the water flow raising tensions over water governance among different ethnic groups in the area. Government-run agribusiness schemes continue to chip at their grazing lands, water points, and religious sites. 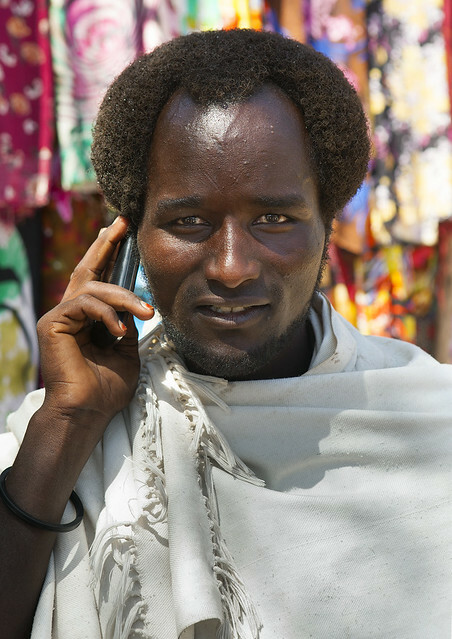 Despite corporate expansions into the area, the Fantalle district is one of the least underdeveloped in Ethiopia with a very poor road and telecommunication infrastructure. 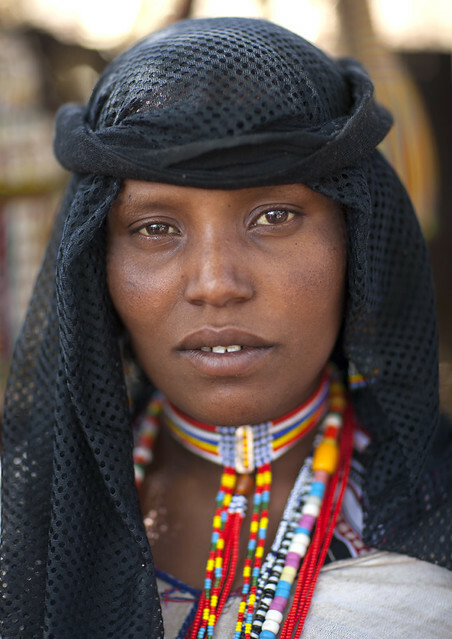 The Karrayyu are highly dependent on Awash river as a source of water for drinking, their livestock, and small scale communal farming. However, in addition to the dikes which limit the water flow, the pollution of Awash river by state-run factories pose a serious health hazard to the Karrayyu and their livestock. 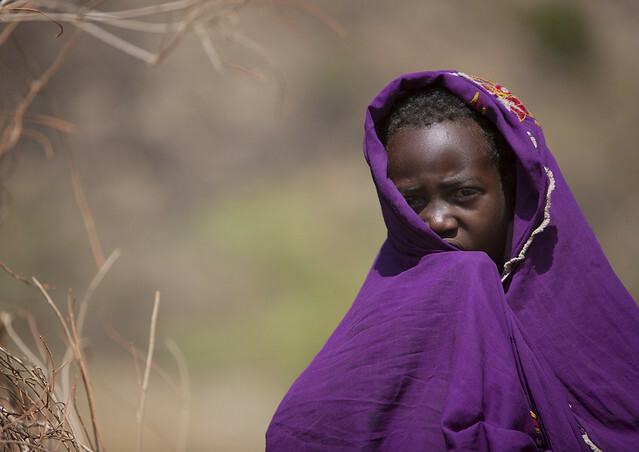 Periodic drought due to delayed rainfall, livestock disease, and conflicts with neighboring communities, primarily the Afar and Argobba, perpetuates the worsening livelihood of Karrayyu Oromos. 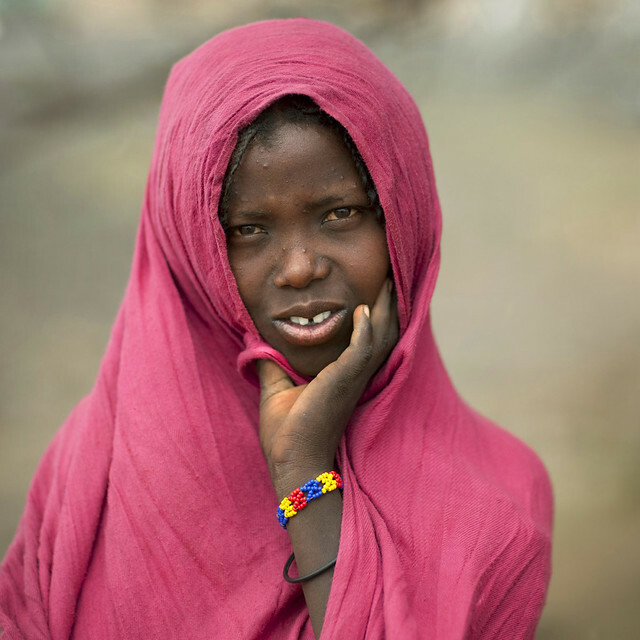 However, the recurrent ethnic conflicts are usually over access to resources (grazing land and water) and land rights. 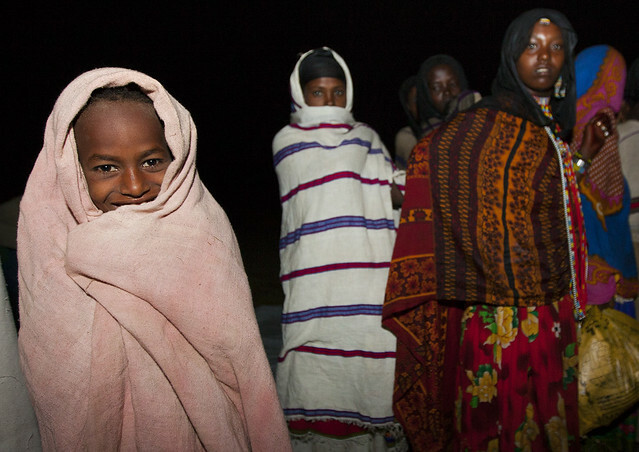 Land is communally owned among the Karrayyu. Currently, a government-led irrigation scheme funded by the World Bank is trying to convince the Karrayyu to embrace agro-pastoralism. 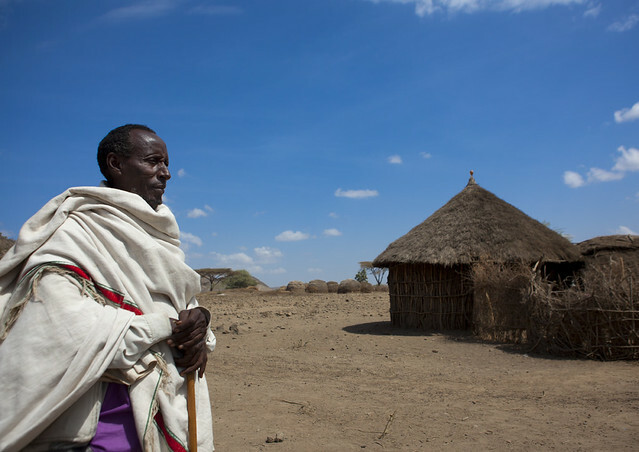 This is threatening to further erode their grazing lands and livelihoods along with the Karrayyu cultural heritage – much of which revolves around the pastoral way of life. “The Karrayyu don’t know how to farm. They are not familiar with money. It is going to be difficult to tell them to leave animal herding, and take up farming.” Some Non-for profit organization like Labata Fantalle are trying to bridge the gap of knowledge and orient the Karrayyu into slowly diversifying their income through capacity building programs such as training on organic farming and resource management techniques. The guests bring food, milk, and gifts for the families who welcomes them.A man writes in a book everything. 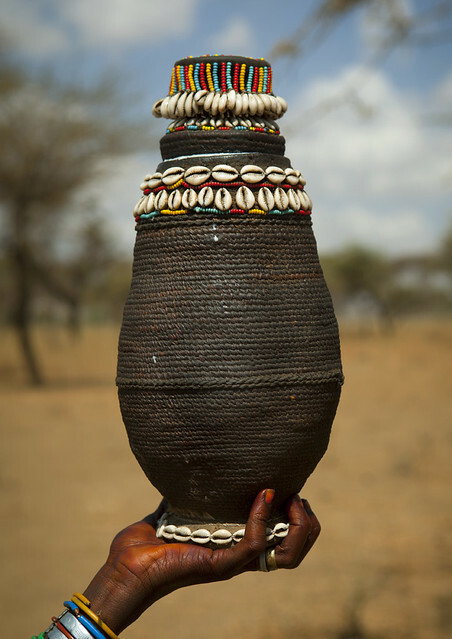 In the center: some fruits are put on cow dungs. it is the virtual door to the cow fence. Nobody can walk on it. 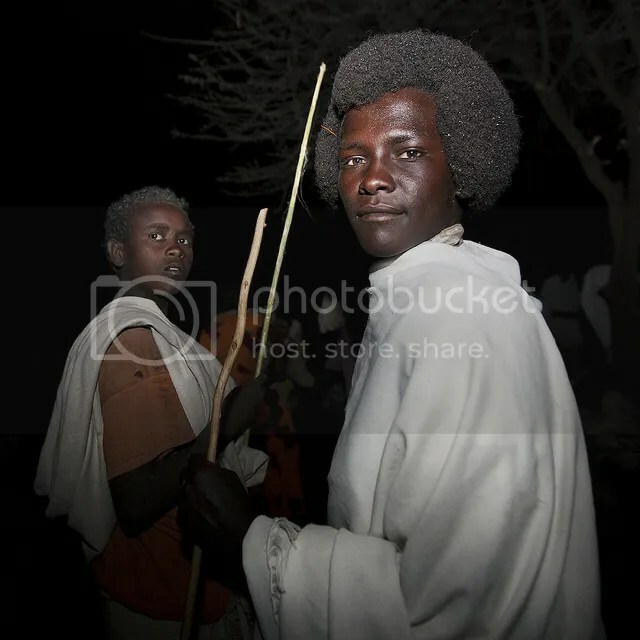 Every eight years under a full moon, a tribe of Karrayyu priests gather in the Methara region, south of Addis Abeba, Ethiopia, for a ceremony to transfer power, this ceremony is named Gada. Five families share and govern the power. In two days, 10,000 people come, mainly by foot to help with the running of the ceremony. Absolutely no tourists are allowed in the proximity. After weeks of negotiation with the tribe’s leader, I managed to obtain access to help at the ceremony. Throughout the entire negotiation process, it was never a matter of money, as is often the case with tribes, it was simply that the ceremony has never been open to foreigners. 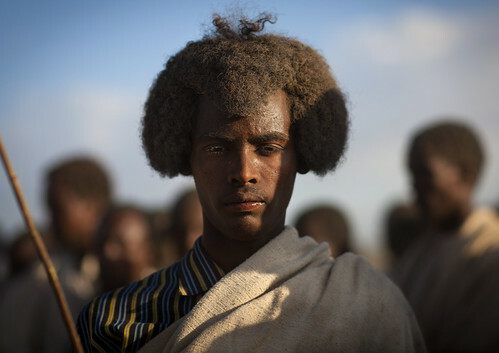 Tired Karrayyu man with his Gunfura traditional hairstyle in Gadaa ceremony – Ethiopia. 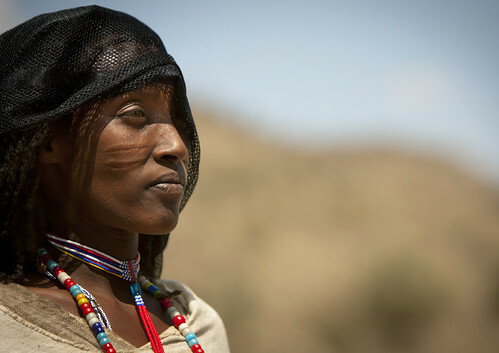 The chiefs finally accepted, the Karrayyus are living in particularly difficult times and their position is precarious. They want to make the world aware of their predicament ; the drought killing off their livestock and the government selling their fertile land to Saudi-Arabia, India and South Korea. 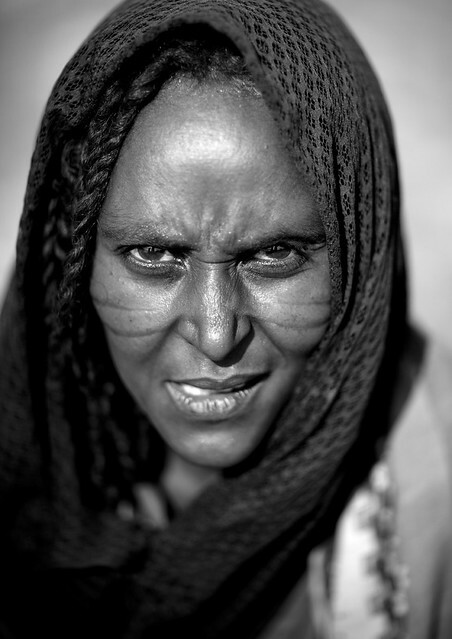 Their former tribal wars with their neighbours, the Afars and the Sidamos, are beginning again. The number of young fighters wearing an ostrich feather in the hair acts of a badge of having killed another man, this acts as evidence of renewed conflict. 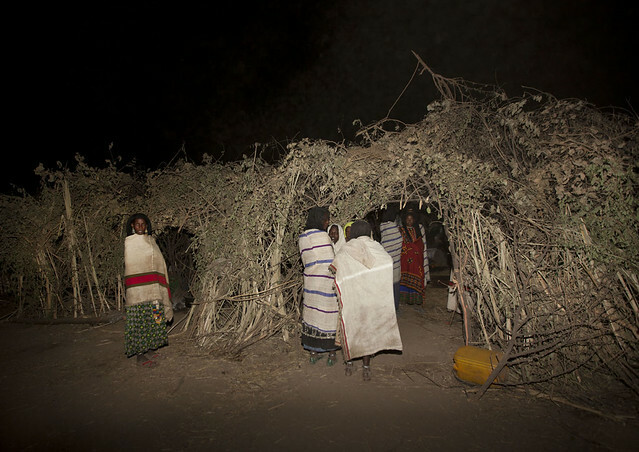 The ceremony takes place in the desert with hundreds of temporary houses having been constructed specially for the Gadda. In front of each house there is cow fencing, the cow being a sacred animal, each one being named like one of their children. A mound of dry cow pat decorated with yellow fruit draws the boundary and the limit that nobody will dare to pass. Inside the house, each family has brought their bugée mataas, a strip of artistically, studded leather, their only valuable object. An accurate list of what has been offered is kept by a sort of official or clerk. 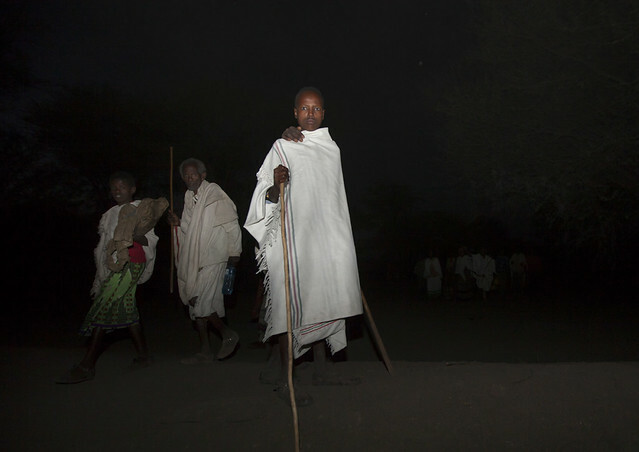 As night falls, the Karrayuus who have not managed to find the friends begin to shout their names, walking up and down in front of the houses. Some send texts from the mobiles, the only infringement of tradition. At midnight, the tribal danses begin, the mass circle forms, the warriors, the Qondallas with their afro hair style leap up and down to show their power. 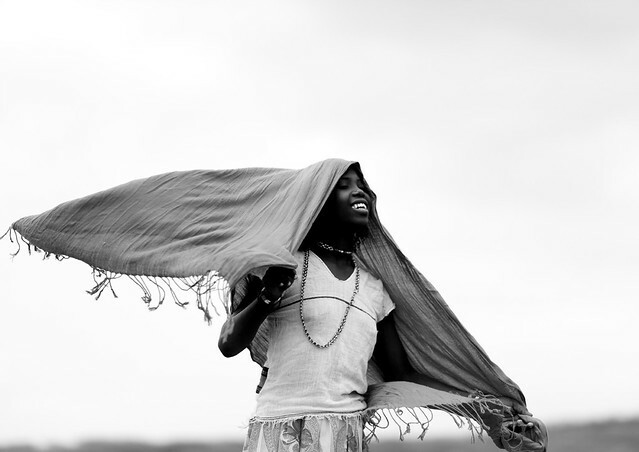 The desert is no longer just an immense dust cloud. At the same time, a group of other men look for the daughter of the future chief. She hides and they must find her, they are fortunate enough to have help, a full moon. Everybody else waits. All of a sudden at 3am, the women who were sleeping using their dresses as duvets leap to their feet and start singing : the chief’s daughter has been found ! The presents are then bought into the houses and the monstrous feast begins. In the early hours of the morning, one hundred cows are sacrificed. Their throats cut by the Gille, a long traditional blade. 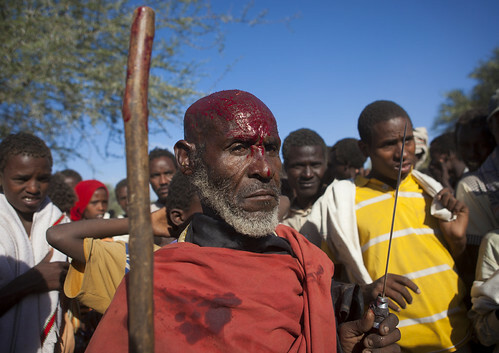 The Karrayuus smear blood on the foreheads of the children as a sign of protection. 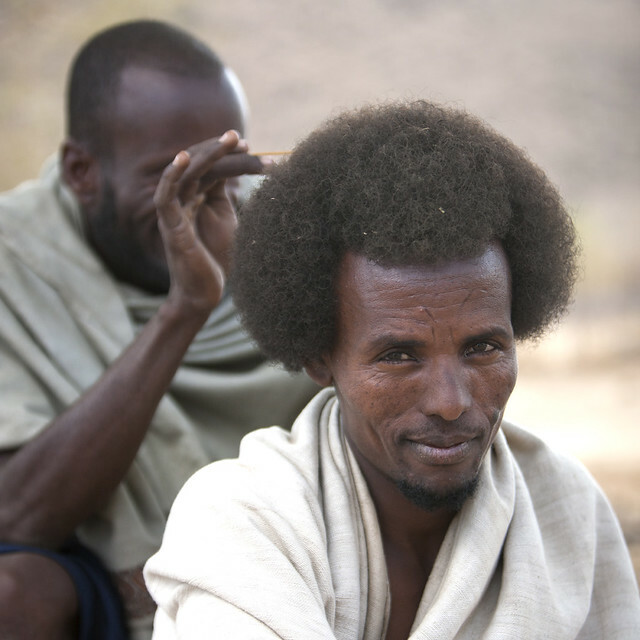 Later on towards midday, all of the men of power including the chief shave the heads meanwhile the women pierce their ears with acacia thornes. 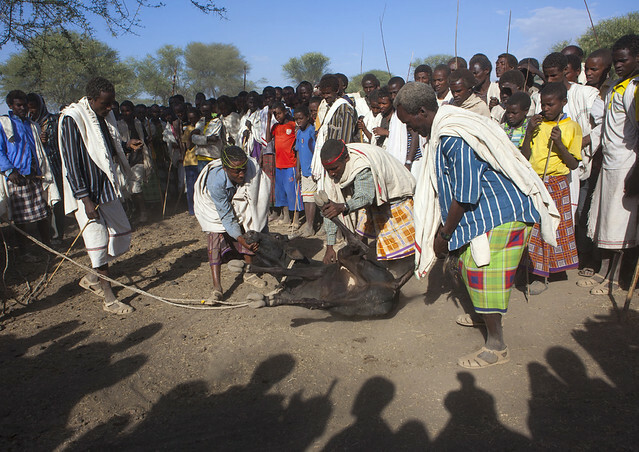 Dozens of cows are again sacrificed, and once again the hot blood is smeared on the mens’ freshly shaven heads, even babies have their heads smeared. At this point, women are allowed to leave the camp. Then comes the solemn, formal moment of the ceremony, the two families face one another. Each holding blades of wildgrass, irrechas and symbols of power. In a mad scramble, the exchange takes place in just a few seconds. The new chief declares power and disappears immediately ! The former chief leaves with tears in his eyes, the warriors pump themselves up in every sense. Drunk with happiness, the chants and songs start again. Everyone agrees to repeat the ceremony, in just 8 years time.